Across the sweep of a thousand years, as ancient cities bloomed and died in southern Mexico, the water in Juxtlahuaca Cave went drip, drip, drip. Now a UNLV researcher is using a stalagmite built by those droplets to chart 2,500 years of rainfall and draw new links between human history and climate change. The findings by professor Matthew Lachniet and his research team could help shed light on Nevada's climate over the past several thousand years and offer clues to how it might change in decades to come. "We have a saying in geo­science: The past is the key to the future," said Lachniet, a geologist and climate scientist at the University of Nevada, Las Vegas. 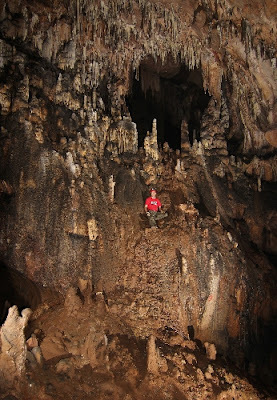 Scientists have only recently begun to unlock the secrets of cave formations as "ancient rain gauges," he said. Outside of tree rings, stalagmites offer one of the most accurate climate records known to science because they tend to grow at a uniform rate and collect traces of naturally occurring uranium. And since they are formed by minerals in water droplets that crystallize and accumulate over the course of thousands of years, stalagmites can offer a much longer record than tree rings. Lachniet and company were able to pinpoint the age of various layers in the stalagmite from Juxtlahuaca to within about 10 years. They could then track rainfall amounts over time by analyzing carbon dioxide trapped in those layers. What researchers discovered was a period of above average rainfall between the first and third centuries that coincided with the rise of the largest early Mesoamerican city of Teotihuacan, near present day Mexico City. That was followed by a 500-year drying trend and more than a century of drought, during which came the rapid collapse of the city around 550 A.D. The dry spell bottomed out around 750 A.D., giving way to another wet period that coincided with the rise of the Aztecs. "The point to be made is that civilization runs on water. Take away a water supply and the civilization may fail," Lachniet said. 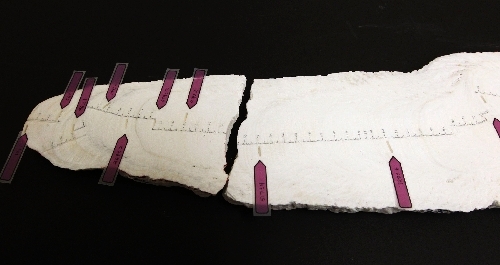 The findings were posted online late last month by the journal Geology. They will appear in the March edition of the publication. What Lachniet and his team found south of the border could have applications here. After all, he said, the same Pacific Ocean climate phenomena that deliver rain to much of Mexico also influence precipitation in Nevada and the Colorado River basin, the primary source of water for the Las Vegas Valley. "It gives us some information about how El Niño acted in the past," he said of his so-called "paleo-climate" research. "The main idea is to better understand these ocean-atmosphere processes that influence how much rain falls." Lachniet is also involved in a host of other climate research. Among the specimens in his lab at UNLV is a chunk of 25,000-year-old ice from Alaska and a cross-section of a stalagmite from a cave near Ely that dates back more than 300,000 years. 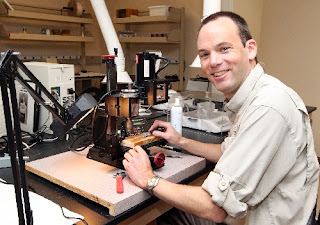 Lachniet began exploring caves in the name of science 15 years ago, while doing his doctoral work in Costa Rica. He joined the staff at UNLV in 2003. He tries to make one or two trips a year to Juxtlahuaca Cave, in the Sierra Madre mountains about 200 miles south of Mexico City, to continue his research funded by National Geographic and the National Science Foundation. His next trip is set for late May, after UNLV breaks for the summer. As caves go, Juxtlahuaca is not that dangerous. It's a mostly horizontal series of caverns frequented by tourists, so Lachniet and company don't need climbing gear or scuba equipment to get inside. But their work site is off the tour route in a cavern known as La Sorpresa, "The Surprise" in English. They need ropes to reach the area, and high levels of humidity and carbon dioxide gas can make working conditions uncomfortable. "If you're not careful you can pass out, which can be kind of a bad deal," Lachniet said. To limit their impact on the cave, researchers use pieces of already broken stalagmites whenever possible. When they did remove a formation, they tried to pick one that was out of view of tourists and wouldn't damage the overall aesthetics of Juxtlahuaca. Lachniet doesn't pretend to be an archaeologist, but he said it's certainly tempting to draw connections between the rainfall history imbedded in their stalagmite and some of the artifacts that have been found in Teotihuacan. None of the evidence unearthed so far definitively proves what happened to the highly developed city that once boasted more than 125,000 people living among its massive pyramids. Maybe drought caused food shortages that forced people to abandon the city or eroded the citizenry's faith in their leaders. Maybe it left Teotihuacan vulnerable to being conquered by a neighboring tribe. "They have found a lot of rain god idols that were smashed, which I think is pretty interesting," Lachniet said. "Maybe they were a bit unhappy with the rain gods." UNLV associate professor Matthew Lachniet has this core sample collected from a stalagmite from a cave in Mexico in his lab. The tabs point out years of layering in the sample. Matthew Lachniet, an associate professor at UNLV, looks at rock formations in a cave in the Sierra Madre region of Mexico during a June 2011 trip. Lachniet says cave rock accurately records rainfall patterns through the centuries. His research might help explain the rise and fall of Mesoamerican civilizations.